A friend and fellow blogger in Japan recently sent me a photo of my kind of drink vending machine (Thanks, Megumi). This one was spotted at Kamakura Station. As anyone who has visited Japan will attest, vending machines dispensing all manner of drinks are found nearly everywhere. Japan has the highest number of vending machines in the world, per capita. Low rates of vandalism and petty crime in Japan make vending machines a practical proposition. One only needs to think about drinking something and a vending machine will be nearby. In the cooler months, hot drinks dominate the selection of teas and coffees available. In the warmer months, cold drinks abound. That’s a small selection just in Japan. Kotaru has a post full of photos of vending machines in Japan, if you’d like to see more. 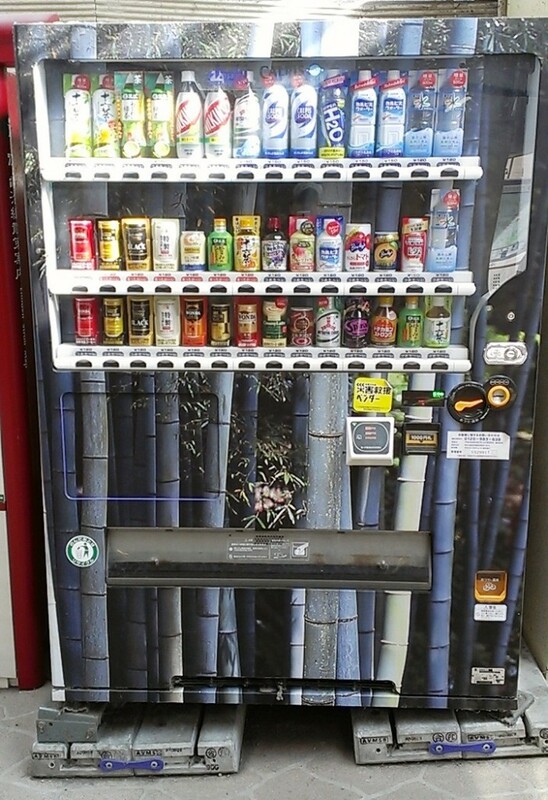 Have you seen a bamboo vending machine? Or at least one covered in bamboo? I’d love a photo. This entry was posted in All, Bamboo around the world and tagged bamboo, Japan, tea, vending machines on 20/11/2013 by Deb.